The sterling silver 3mm gemstone tennis bracelet comes in various gemstones - Lab-grown Ruby & White Topaz, Amethyst and White Topaz, Peridot and White Topaz, Lab-grown Sapphire & White Topaz. It also features 925 sterling silver that is plated with rhodium for extra durablity. The bracelet comes with a length of 7.25 inches with box clasp and comes in various gemstones each that will fit into your everyday style. The different variations of the bracelets makes this an excellent gift choice. 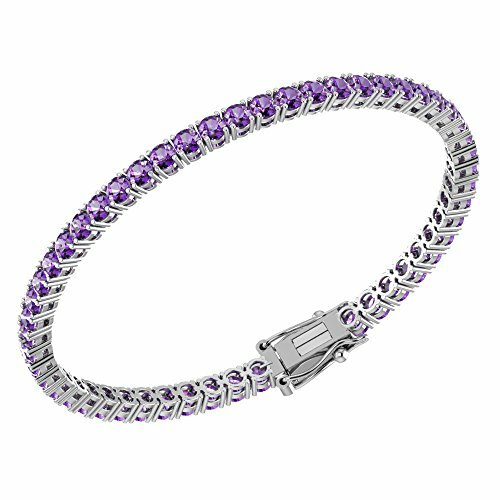 SPECS - The sterling silver tennis bracelets is high polished and made with solid 925 sterling silver and combined with natural amethyst and white topaz gemstones. Its design gives off a distinct look and a sleek finish. This 7.25 inch bracelet comes with a sleek and modern style that compliments it's overall look. The bracelet is high polished with eye clean gemstones. Total carat weight of 4.29. DESIGN -The lab-grown ruby and white topaz feature alternating gemstones; high polished shiny finish of the bracelet will add a great touch to your outfit and match your trendy style. The piece itself has 3mm gemstones and box and tongue clasp that will give a comfortable and secure fit. STYLISH - The design allows for these tennis bracelets to be worn anywhere. Whether it's formal or causal it's a great fit for any style that you're going for. If you have any questions about this product by Silver Smile, contact us by completing and submitting the form below. If you are looking for a specif part number, please include it with your message.